It is common knowledge that a tanning bed can increase your risk of developing skin cancer, but a tanning bed can have adverse effects on your hair as well. Not only can the bed dry your hair out, but it can also change the appearance of color-treated hair if it is not protected properly. Wear a shower cap while you are in the tanning bed. Tuck all of the hair inside the shower cap if you want to keep it protected from the UV rays. This is one of the most effective ways to prevent your hair from undergoing any serious damage. Ask the tanning salon about any products that they sell to protect your hair. 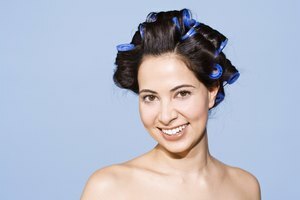 Most salons sell a product that resembles a shower cap. 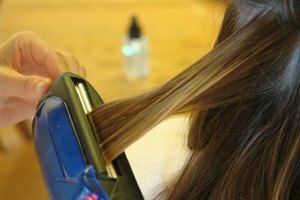 It will also work the same way but is designed to specifically protect color-treated hair from changing due to the UV rays. Use a beanie hat while you are in the tanning bed. Tuck all of your hair into the hat. The only downside to a beanie hat is that it may cause you to overheat while you are in the tanning bed. If you are choosing this option, turn on a fan while you are tanning. Opt for a large headband to keep the hair protected while in a tanning bed. It will work similarly to using a beanie hat but without the added heat. The only downside to using a headband is that the hair that is not entirely covered will experience some damage as a result of the UV rays in the tanning bed. Use a headscarf or bandana to protect hair while in a tanning bed. The best way to ensure that all of the hair is covered is to put it in a ponytail or bun. Then wrap the headscarf or bandana around your head, tucking in all of the hair. This can be a cooler alternative to wearing a beanie and will offer more protection than a headband. 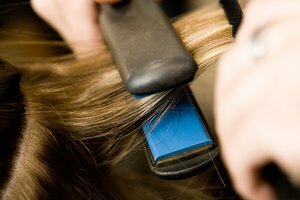 Spray a small amount of leave-in conditioner on the hair prior to tanning. The heat will absorb the added moisture before it does damage to the hair. Leave-in conditioner can also prevent UV rays from having a drastic effect on the color of your hair. Keep in mind that certain scalp conditions, such as psoriasis, tend to benefit from the use of tanning beds. Choosing not to protect the hair may be ideal. Be sure to use a moisturizing conditioner to prevent the hair from drying out. Using products for color-treated hair can ensure that the hair's color does not lose its brilliance in a tanning bed.